It’s Halloween week! That means that it’s the official(?) final week for everything pumpkin to appear on the blogosphere. I know, it’s sad, but not to worry – I have some majorly delicious Thanksgiving recipes in the works. But before we get there, here’s my last pumpkin hurrah for the year, and it’s a good one! I think you will love this French toast whether you’re vegan or whether you just happened to have run out of eggs. The pumpkin puree acts as the custardy base so perfectly. 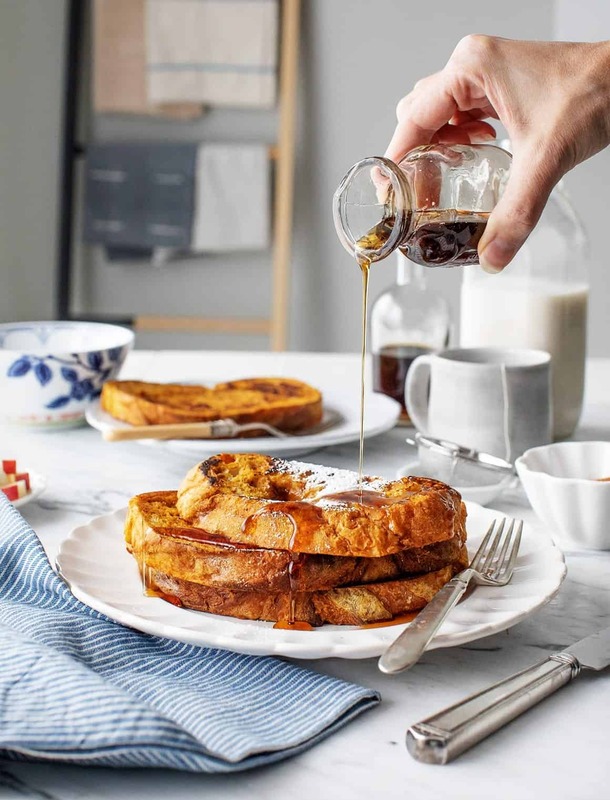 I love this version even more than my original vegan French toast, which continues to be one of the most popular recipes on our site. This is made with just a handful of ingredients, see above. The most important one is the bread. Your French toast will only be as good as your bread, so grab a nice sourdough or ciabatta loaf, and slice it into thick slabs. Day-old bread is preferred, just stay clear of thinly sliced sandwich bread. Once you’ve mixed the batter together, pour it over your slabs of bread. Then use your hands to slather it all over (that step is not pictured because it was not so photogenic). Cook it up in a skillet, then serve your French toast with lots of maple syrup and whatever toppings you like! With your extra pumpkin puree, you can make Vegan Pumpkin Snack Cake, Pumpkin Pancakes, Pumpkin Oatmeal Chocolate Chip Cookies, Pumpkin Bread, or Pumpkin Waffles. 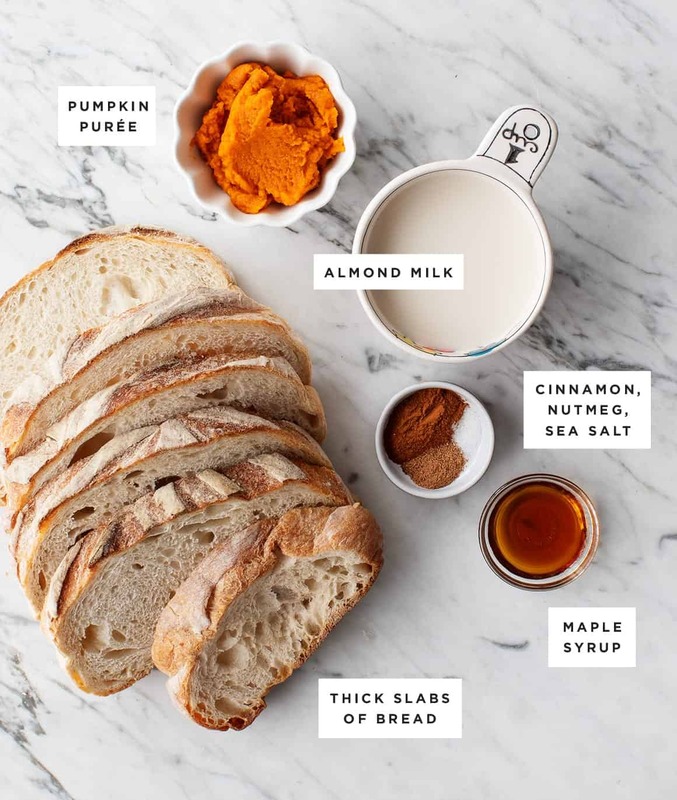 In a medium bowl, whisk together the almond milk, pumpkin puree, maple syrup, cinnamon, nutmeg, and salt. Place the bread slices on a large platter or tray and drizzle with the pumpkin mixture. Use your hands to spread the mixture, coating all sides of the bread. Heat a non-stick skillet to medium heat and brush with coconut oil. Add the bread slices and cook until golden brown, about 2 minutes per side. Reduce the heat to low as needed to cook thoroughly without burning. Serve with maple syrup and desired toppings.